In Texas, economic opportunity follows the water. The economic impacts of the Guadalupe’s management ripple throughout the basin, but the first communities to feel damage from over-drafting the river are along the coast. Coastal Bend communities are dependent upon the freshwater from the Guadalupe River flowing into the bays to support tourism, commercial fisheries and recreational fishing. Excess water diversion is likely to result in the loss of millions of dollars to coastal communities. San Antonio Bay: Measured Freshwater Inflow and Salinity data from 2007-2009. The coastal ecosystems of the Aransas area are the litmus test of how effectively we are managing the Guadalupe River Basin. When the bays and estuaries show signs of strain and increased salinity, we need to address water management in the basin. From 1941 to 1987, the San Antonio Bay received an average of 2.3 million acre-feet of inflow annually. During wet years, there generally is plenty of water for all users and still adequate freshwater is left to flow into the bay. 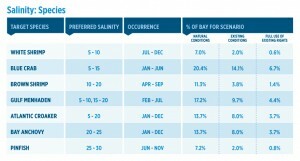 It is during the dry years that the over-allocation and mismanagement becomes evident and salinity in the bays escalates. The recent drought conditions in Central Texas lasted over eighteen months, and were nearly as bad as the so-called record drought of 1954–1956. TAP’s studies show that potential future use of existing permits will result in annual reductions on the order of 100,000 acre feet per year from current conditions or a total reduction from natural flows of almost half a million acre feet. As a result, the salinity of the bays where the whooping cranes spend winter will be significantly changed from the natural conditions. The Aransas area is one of the most beloved fishing regions nationwide, supporting many fishermen, fishing guides and businesses that depend on the freshwater inflows to protect the health of the bays and estuaries. A 2006 survey by U.S. Fish & Wildlife Service put the total expenditures associated with fishing in Texas at more than $3.2 billion and the total expenditures associated with wildlife watching at more than $2.9 billion. A significant percentage of this spending takes place throughout the Guadalupe River Basin and bays along the coast fed by the river. The Guadalupe River is considered one of the premier areas for both commercial and recreational fishing. In 2005, Trout Unlimited’s Guide to America’s Top 100 Best Trout Streams included the Guadalupe. Texas Coastal Wetlands reports that the total economic impact of commercial fishing at the wholesale level is more than $400 million annually, employing about 30,000 coastal residents. The total economic impact of saltwater sport fishing in Texas is almost $2 billion annually, employing about 25,000 coastal residents. Change in % Area of San Antonio, Espiritu Santo, Mission and Carlos Bays Suitable for Various Marine Species Under Natural Flows, Existing Usage and Full Future Usage of all Currently Permitted Water Rights. 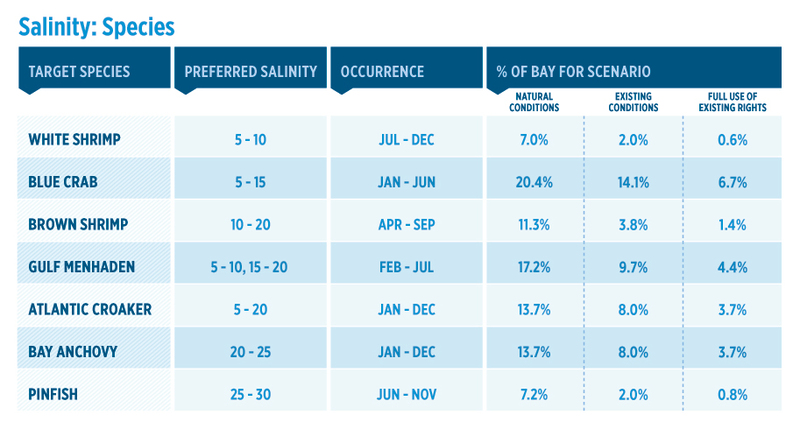 In years of drought, the salinity levels of the bays and estuaries see increases that adversely impact species such as the blue crab and the brown shrimp. Area fishermen describe 2009 as the worst the region has seen—likely linked to the impact of low flows on salinity. The full use of existing water rights will dramatically increase the salinity levels and widens the number of species that will be impacted. The Aransas Project supports the opening of Cedar Bayou. Blue crabs, a primary food source of whooping cranes, migrate to passes between the bay and the Gulf to spawn. The provision of another pass near the refuge to provide an additional place for spawning will be beneficial to crabs which will be beneficial for the whooping cranes. If this productive ecosystem that has historically supplied the Aransas fishing industry is to be kept in tact, existing water commitments in the Guadalupe River basin must be addressed. Currently, this cornerstone of the community is being left vulnerable to destructive salinity levels during times of low rainfall—to ensure the stability of its future, we must maintain the freshwater inflows from the Guadalupe River Basin that help keep the area thriving. Local business owners and community leaders describe how decreased freshwater flows adversely impact the bays and ecosystems of the coast—and their way of life.